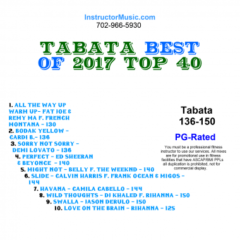 We present the new Tabata workout mix that features this year’s greatest Top 40 and crossover hits. Highlights include “Perfect”/Ed & Bey, “Bodak Yellow/Cardi B and Demi’s “Sorry Not Sorry”. ! 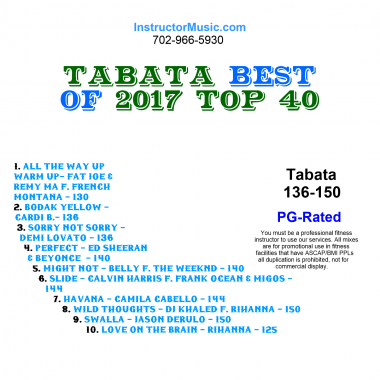 The current #1 song in the country “Havana” from Camila Cabello is also included. This mix is PG-Rated. The structure of these 4 minute mixes is 20 seconds of all out exercise followed by 10 seconds of rest, with voice overs of 3,2,1 Rest and 3,2,1 Work. There is a 1 minute drum solo between tracks.